In today's blog we look at South Africa's long term unemployment rate and find that the country's structural level of unemployment or natural level of unemployment is steadily increasing over time. And this is not helped by the fact that South Africa's under utilization of its production capacity remains at around 20%. Long term level of unemployment in South Africa? 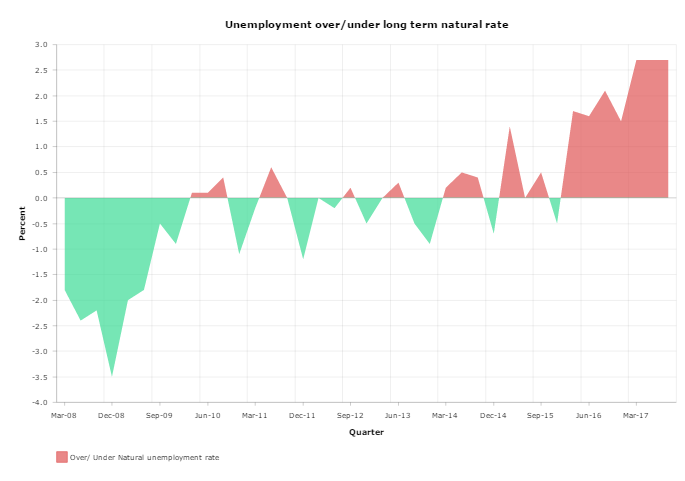 The graphic below shows South Africa's long term unemployment rate as well as its 4 quarters (moving average), which helps smooth out seasonal variations in the unemployment rate. Unemployment does have a seasonal nature in at, as more people are employed in retail sector in December for the December holidays for example. As the image above shows the general trend in South Africa's unemployment rate is on the increase, with it increasing from levels around 22% to almost 28% from 2008 to 2017. Thus in the last 9 years South Africa's unemployment rate has increased by almost 25%. That's a significant increase in the official unemployment figures. Yet countries such as the USA are sitting with historically low unemployment levels of around 4.5%. And without South Africa addressing the serious unemployment problem it has, wealth will not be redistributed to the previously disadvantaged population groups. And this leads to increased protests, racism, hate and animosity among South African citizens. Addressing South Africa's unemployment problem should be the government's top priority at this stage. If unemployment can be reduced, the tax base will be wider, which should help SARS meet their revenue targets which in turn will help government fund their spending programs without having to increase their debt and their debt servicing costs. Greater employment will lead to greater spending which should lead to greater VAT revenue collected which will also add to government's pool of available funds to spend on their various programs. When the area is green or below zero, it shows that the unemployment rate at the time was below the natural rate of unemployment (this is a good sign and shows that during that period South Africa was making headway in addressing it's unemployment problem. When it is red, it shows the unemployment rate at that time is higher than long term rate, and South Africa is failing in addressing the unemployment problem, and that it is in fact getting worse. Concerning for South Africa is the fact that the unemployment rate has consistently been higher than the long term natural rate of unemployment in South Africa since March 2016, so for the last 7 quarters (21months) South Africa has not made any headway in addressing their unemployment problem. Far from it, it has actually been getting worse and pushing up the natural rate of unemployment. South Africa's economy has certain structural problems which is contributing to the stubbornly high unemployment rate. Part of the problem is greater automation in labour intensive industries (such as mining and agriculture), lack of qualified, trained staff for certain positions (due to lack of education and/or experience). South Africa's economic fortunes are tied to a few industries who's returns and growth is highly variable (think commodities and their prices) or agriculture which is dependent on mother nature. Droughts/floods will affect the returns and the employment levels of these industries, in the same way volatile commodity prices affects the returns and the employment levels of the mining industry. South African policies needs to start focusing on the more stable sectors of the economy to ensure growth in these sectors take place so that more can be employed in these sector so that the dependence on the more variable sectors are lessened.